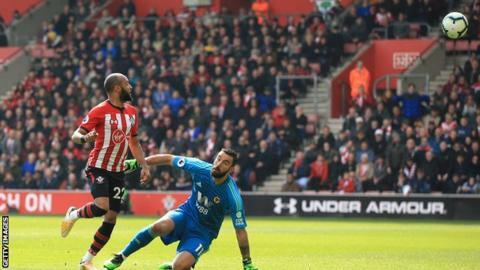 Southampton will "do everything" to reach 40 points after they took a huge step towards preserving their Premier League status for next season with victory over Wolves. "We lost here not long ago against Cardiff and it seemed it [battle against relegation] would go right to the end, so we are very happy," said manager Ralph Hasenhuttl, who took over at the start of December when his club were in a precarious position. Substitute Shane Long settled any nerves among his team-mates and the home fans when he poked in Southampton's third in the 71st minute. What Southampton fans will also be pleased by is their new manager's style of play, which is far more cavalier than the approach adopted by predecessor Mark Hughes. If he continues this rich form into next season then perhaps Redmond might find himself with a regular spot in Gareth Southgate's England side having been a stalwart at youth level. Despite going behind early on, there appeared to be no hangover from last week's FA Cup semi-final defeat as they began to control possession. Their equaliser, courtesy of Boly's header, was deserved following a spell of heavy pressure, but a lapse in concentration at the back meant they were behind once again only two minutes later. This season's top scorer Raul Jimenez should have, but he was guilty of a woeful volley from eight yards out. Wolves manager Nuno Espirito Santo: "Our defensive structure was not the best - it is something that we have to look at. "We left too many spaces and we allowed them to play. Today they were better than us and we have to regroup and bounce back immediately. Our trip to Spain was planned before and we feel it is a good moment to have an opportunity to train and be together." Wolves have not kept a clean sheet in any of their last 13 Premier League away games - only Arsenal (15) have had, and are currently enduring, a longer such run in the competition this season. Redmond's opener after a minute and 34 seconds was Southampton's quickest in a Premier League game since December 2016, when Virgil van Dijk netted after 1min 9secs seconds against Tottenham. There were just 118 seconds between Boly's equaliser and Redmond restoring Southampton's lead.